You know how much less annoying Rob Marshall’s 1999 version of Annie was than John Huston’s 1982 version? Well, the new remake of Annie is at least that much less annoying again. It is literally the least annoying adaptation of Annie that there is. And I don’t say that lightly. Annie always scores fairly highly on the annoyingness factor as far as I am concerned. I ought to love it. It ticks all my film favourite boxes: chirpy musicals, rag, riches (and the progression from one to the other), mistreated orphans. (Blockbuster video stores always had a ‘mistreated orphan section’ back in the day of course). But I’ve never quite warmed to it. This probably has a lot to do with Annie herself. If the kid isn’t lovable then the whole thing falls a bit flat. (Clearly I have unreasonably high expectations of orphans. Unlike Daddy Warbucks, I should probably never be allowed to adopt one as a publicity stunt). 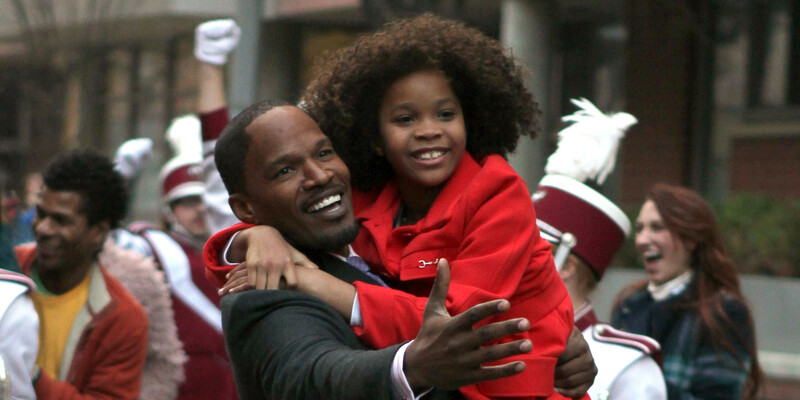 This version stars Quvenzhané Wallis as Annie. Wallis established herself as an accomplished award-winning actress in 2012’s Beasts of the Southern Wild filmed when she was only six years old. She is more than up to the task of delivering a performance which combines a streetwise attitude, vulnerability and genuine charisma without allowing the character to ever become cloyingly sweet. The film is produced by Will Smith and was originally intended to star his daughter in the title role. The fact that Willow Smith became too old for the part is no bad thing. It is impossible to imagine another actress could have done the task half as well as Wallis. The biggest change between this and earlier adaptations of Annie is that the story is no longer set in the 1920s. The story is squarely placed in the modern day. Our chirpy little ragamuffins no longer sing “No-one cares for you a smidge / when you’re in an orphanage.” Now it’s “No-one cares for you a bit / when you’re a foster kid”, which doesn’t seem like it should scan but they seem to manage it OK.
Daddy Warbucks in 2014 is now named Will Stacks, a businessman and mayoral candidate, played by Jamie Foxx. He’s not a people person and his germ-phobic avoidance of the very people he wants to vote for him isn’t doing great things for his popularity ratings. He manages to overcome his dislike of touching when he pushes Annie out of the way of an oncoming vehicle, however. The incident is of course recorded on someone’s phone and when it goes viral, he finds his ratings leap up accordingly. This leads to a hastily arranged photo opportunity which then escalates into Stacks having Annie over to stay at his apartment. All of which is managed in a surprisingly non-creepy way. In fact ‘surprisingly non-creepy’ would be a good movie poster quote for Annie. It must be a bit of a challenge these days making a film about the love that develops between an adult man and a ten year old girl who aren’t related to one another. Stacks lives in a flashy high-tech penthouse apartment surrounded by whizzy technology which means he doesn’t have to have staff or, you know, interact with people ever. Gosh, if only there was some way somebody could break through that people-avoiding shell he’s built up around himself. One puzzling thing is that, for the head of a supposedly bleeding-edge technology company, Stacks’s phones look like the clunkiest least convincing bits of gadgetry ever. It looks like someone’s stuck a couple of empty cigarette boxes on top of one another and then sellotaped a picture of a screen and some buttons onto it. I am not sure if this is supposed to be some biting commentary on consumerism or if they just accidentally gave the job of making the phone props to a six year old. Jamie Foxx is fairly lovely though. He convincingly manages to portray a person cut off from – but still quite capable of – love. Well, Quvenzhané Wallis probably does all the work, to be honest, but Foxx responds in the right places. Rose Byrne plays Grace, Stacks’s erstwhile assistant. In previous adaptations the movie has always ended with Warbucks and Grace getting together. I wasn’t sure if that would happen here because, well they’re not the same colour you see, and American mainstream movies often seem to be a bit squeamish about that sort of thing. But I am delighted to report that [Not really spoilers!] they do totally snog at the end. 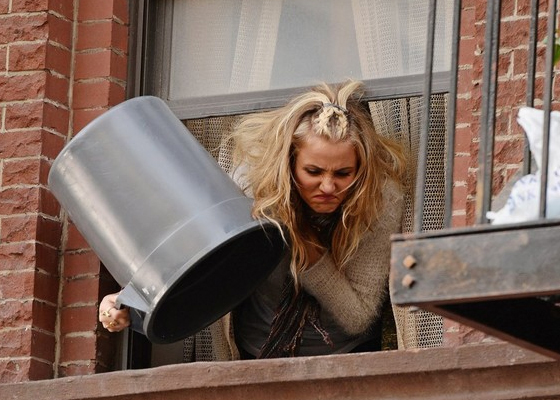 The one flat note in the production is Cameron Diaz’s performance as Miss Hannigan. Diaz does her best but the role of the mean Foster Mum suffers the most from being moved from the 1920s to the modern day. Abusing orphans is so much less fun when it’s taking place in 2014. Clearly the filmmakers took this on board when they gave modern day Miss Hannigan a more sympathetic character arc than her predecessors. I didn’t like it. I want my evil, drunk orphan-wranglers to be properly evil and properly drunk, godammit. Still, at least there were all the songs to keep me cheery. It probably helps if you are already familiar with the musical in order to appreciate the way that have mucked about with some of the numbers. The opening titles are particularly rewarding as Annie’s sprint through New York takes her past snatches of each of the songs being played in the soundscapes of the city. All the songs you want are there. ‘It’s A Hard Knock Life’, ‘Maybe’, ‘I Think I’m Gonna Like It Here’, and, of course, ‘Tomorrow’. (or ToMORRooooowwwww TOMORROOOOWWWWW, I love ya, TOMMMMOOOORRRRROOOOOWWWWW, as you are now singing in your head). There are a number of new songs included as well which fail to pack the same punch as the original numbers. Stacks’s presumably supposed-to-be-inspiring ‘This City’s Yours’ pretty much grinds the film to a halt for a bit and Annie’s number ‘Opportunity’ provides a weird moment in the film. The people around Annie as she bursts into song, literally respond in a kind of “Wow, can you believe it? She just burst into song!” way. Dudes, you’re in a musical. You can all do that, you know. The whole film does begin to drag a bit for the final third but luckily manages to pull it all together for the end. So by the time we had Wallis and Foxx chirpily singing and dancing to ‘I Don’t Need Anything But You’, my heart had been thoroughly warmed. In fact I may have even shed a tear or two. Because especially at this time of year, it’s hard not to get a bit teary eyed at a charismatic young girl and a cynical rich businessman discovering the true meaning of family. Especially if they manage not to be annoying while they’re doing it. Annie is on general release, as of today.